Custom Foot Orthotics | Arch Support Many of the foot problems we see at Richardson Podiatry Center are due to faulty biomechanics, which can be corrected with custom foot orthotics. We take so many steps in our lifetime that it becomes easy to take for granted the actual physics of what it takes to propel our bodies forward. Our bodies are a complex set of moving parts that help coordinate such activities as walking and running. When people think about what it takes to walk or run, the joints at the knee or ankle probably comes to mind, but the biomechanics of the foot also play a major role in how the other pieces all function. Your complex set of moving parts is truly impacted from the ground up. When we look at the motion performed by your feet when you take a step, either by walking or running, it begins with the heel striking the ground. As your foot advances in the process, the arch becomes elongated and flattens, which enables the force of your bodyweight to be adequately absorbed. It also allows the foot to roll inward and conclude with a final push from the ball of your foot and your toes. This entire process, called pronation, is a natural part of your body’s biomechanics, but it can be affected by a key factor. While everyone’s feet serve the same inherent functions, they are not all identical. Length and width are obvious variances from person to person, but so too is the height and functionality of foot arches. Some individuals have fleet feet and others have high arches. Actually, a majority of people fall into one of these two categories, so if you have “normal” arches you are in the minority. Differences in arch types is quite important when it comes to biomechanics of the foot. Flat feet and high arches can lead to mechanical situations known as overpronation or supination—also called underpronation. 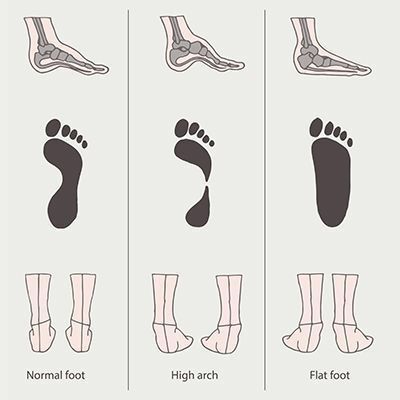 These variations of pronation are essentially the body’s way of compensating for differences between where your arches “should be” versus where they are in regard to height. As your body compensates for arches by either over- or underpronating, it will likely affect your personal manner of walking or running, also known as your gait. If your body is overcompensating for a severe case of either flat feet or high arches, then you may experience painful conditions, especially in your feet, ankles, and/or knees. When this happens, it is time to see Richardson Podiatry Associates. When you get to the point that you need to come in for expert care, we will discuss what is happening and identify a course of action to take care of it. A key component of this process is gait analysis. This involves a systematic study of the motion your feet and ankle are going through with every step. In addition to pronation issues, parents sometimes bring in toddlers and young children who are experiencing either in-toeing, also known as “pigeon toe,” or out-toeing. Though most often children will outgrow these kinds of issues over time as their legs and feet develop, it is important to bring them into Richardson Podiatry Associates to evaluate why the condition exists (there are three main causes) and if treatment is necessary. We will have a better understanding of what exactly is happening with the biomechanics of your feet and ankles following the gait analysis. This will allow us to create a treatment plan that corrects the condition that is giving you so much trouble. One way of helping a gait that is being thrown off by improper pronation is to use customized, prescribed shoe inserts known as orthotics. These medical devices are not the same as the “one size fits all” style found in retail stores. An effective pair of orthotics needs to be customized to your unique feet. Here at Richardson Podiatry Associates, we are able to perform expert analysis of biomechanics of the foot and identify issues and how to treat them. Dr. Gene Reister is committed to providing the highest level of care for you, so call (972) 690-5374 to make an appointment at our Richardson, TX, office today!